How much does it cost to travel to Wernigerode? 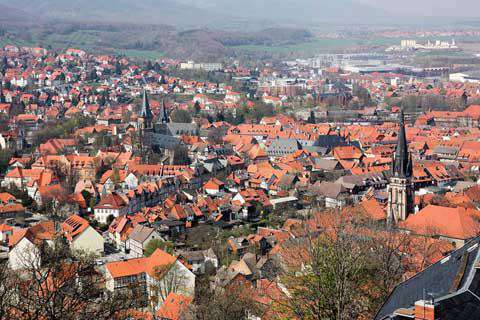 How much money will you need in Wernigerode? €36 ($41) is the average daily price for traveling in Wernigerode. The average price of food for one day is €9.89 ($11). The average price of a hotel for a couple is €53 ($60). Additional pricing is in the table below. These average travel prices have been collected from other travelers to help you plan your own travel budget. How much money do I need for Wernigerode? Dating back to the 10th century, Wernigerode is a charming medieval town in Central Germany. Nestled in the northern foothills of the Harz Mountains, it is best known for its fairytale castle overlooking the old village of timber-framed houses. The most prominent landmark of the town is, of course, Wernigerode Castle (or Schloss Wernigerode). Though it is a climb from the old town center, the view of the village below at the edge of the Harz Mountains is well worth it. The castle is also open for tours inside its elaborate halls, and its grounds and surrounding woods have a network of footpaths. Within the village down below, the most prominent landmark is the Medieval Town Hall-a focal point of the market square (Marktplatz) and "pearl" of medieval timber-framed architecture. Dating back to the 11th century as a courthouse and event venue, the Town Hall is today open for tours with a restaurant in its cellars. Also eye-catching is St. John’s Church, located on the northwestern edge of the old town. Dating to medieval times, it is Wernigerode&apos;s oldest surviving church, showcasing Romanesque and Gothic styles. Other unique features of the village include Wernigerode’s smallest house (now a museum), the Krummel House (now a restaurant), the Old Mint (now the library and town archives), the oldest house, Western Gate Tower (part of Wernigerode&apos;s old fortifications), the Old Orangery pleasure garden, and the ornate cast iron town fountain in the market square. Wernigerode is a charming old medieval town, especially at its center. Here in the town square visitors will find cobblestone streets and timber-framed houses straight out of a fairytale, especially with the castle overlooking the town. In the warmer months the cafes and restaurants have outdoor seating so guests can enjoy the village architecture and beautiful flowers that complement it. Even in winter, the village becomes a magical holiday getaway with warm glowing pubs within a landscape of snow-covered cottages. In any season, visitors can spend days wandering the town&apos;s narrow medieval streets and unique oddities. Those who visit Wernigerode often use is as a home base for exploring the northern Harz Mountains on foot or by mountain bike. These stunning mountains can also be enjoyed by rail via Harz Narrow Gauge Railways, which has a network of routes through the some of the most beautiful mountain scenery. You can even take a steam train to the top of the Harz’s highest mountain, the mighty Brocken. The Brocken is also a major destination for hikers visiting the area. Beside its charming architecture, the town itself also has a few museums, including the castle, as well as Harz Museum, which showcases the history of the mountain range through rocks, minerals, fossils, mining industry, plants and animals, and the history of the town. Others include the Museum of Aviation and Technology and the Firefighting Museum. And, of course, there is the shopping. Germany, including the Harz region, is especially known for its local spirits (like bitters) and wooden toy industry, products from which are abundant in the town&apos;s shops and at Wernigerode&apos;s Christmas Market during the holiday season. Being an old medieval village, Wernigerode&apos;s cooking is mainly traditional, and most traditional German dishes are hearty and rustic, usually based in meat and potatoes. Some typical meat dishes include things like Sauerbraten, which involved marinating meat in vinegar or wine vinegar for several days, or Bratwurst sausages, which are eaten more as a fast food. Wernigerode is very close to the Thuringia region of Germany, a largely wooded area that makes for a wide variety of wild mushrooms used in cooking, as well as wild berries like blueberries, cranberries, raspberries, and blackberries, which usually accompany game dishes. Other sides are, for the most part, potato-based, including things like boiled, mashed, or pan-roasted potatoes, as well as french fries, which are called pommes frites or fritten in Germany. Thick pastas are also used on occasion. For dessert, a variety of cakes, tarts, and pastries are served, with some local favorites being cakes like Harzer Baumkuchen and Brockentorte. Beer is also widely popular with a number of local pubs and breweries. The nearest major airport to Wernigerode is Erfurt Airport, which is about 2 hours away by car. Also nearby are Hanover Airport, about 1 hour and 15 minutes away, and Leipzig Airport, about 1 hour and 30 minutes away. The easiest way to travel without a car is to fly into Hannover Airport, take the train from the airport to Hannover Central Station, then change platforms to take the scenic 2.5-hour ride to Wernigerode. It seems to be the thing to do throughout Germany, but particular in Wernigerode. Dessert! Well specifically ice cream shops abound in this small town. The best way to enjoy Wernigerode is to do what the locals do. Grab yourself a bratswurst from an outdoor stand for about 2 euros. Linger on a bench while you people watch then head to an ice cream shop for dessert. If you have time, also consider heading to the zoo. It's really nothing more than a few animals in a park, but it's free, and you can enjoy the afternoon with a few Germany families and their children.